You wouldn’t have picked her out as the ideal holiday companion. Yes, she was pretty and petite, with soulful eyes and beguiling eyelashes. But Salome was also narrow-minded, with a strident voice, crooked teeth, a curious body odour and a broad, hairy backside. Then again, she was available. Ultimately, that’s all that matters. My wife agreed. We had decided at short notice to spend a few days trekking in the Cévennes, near Millau in southern France. The children – then aged nine and 11 – were struggling to see the point. It made sense to sweeten the pill by using the region’s most famous form of transport: a donkey. 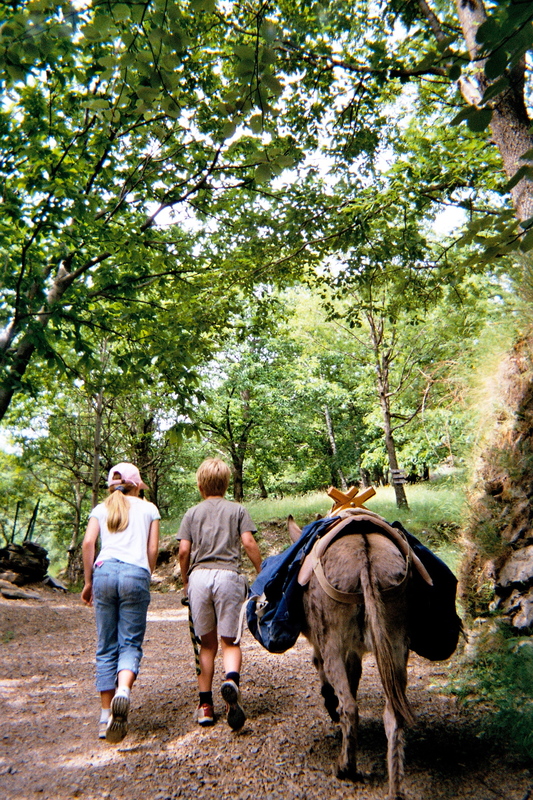 Tourists have been seeking asinine assistance when walking in these parts ever since Robert Louis Stevenson published Travels with a Donkey in the Cévennes in 1879. Many still follow religiously in his footsteps, retracing the author’s 12-day hike from Le Puy-en-Velay to St-Jean-du-Gard along what is now “The Stevenson Trail”. Others are driven by practical considerations. The Cévennes are less backward than they were in Stevenson’s day, but no less steep. A beast of burden can lighten the walker’s task considerably – in theory. In practice, we had barely climbed the first hill before Clare and the children ruled that it was “cruel” to ask so slight a creature to carry our giant rucksack. This flew in the face of what her owners had told us, but I didn’t put up much of a fight. Even with a 40lb load on my back, I quickly realised that, as we walked, all sorts of cares were slipping from our shoulders. A rough path took us through an ancient forest which thinned occasionally but never quite ended. Sometimes we emerged at a high vantage point, to gaze over thrilling green seas of wilderness. Then the trees would swallow us again. There was nothing much to look at – just the hypnotic complexity of unspoilt nature. We walked; we chatted; we drank in the dappled sunlight and the forest scents. The sound of our footsteps was lost in birdsong and rustling leaves. And the whingeing, which we would have expected to begin within an hour or so, was strangely absent – apparently diffused by Salome’s presence. The children took it in turns to lead her, and occasionally had short rides. She seemed to enjoy it and, indeed, to like our company. (When we stopped for the night, she trotted to meet us with a joyful bray in the morning.) Sometimes, though, her agenda baffled us. She would refuse – for no fathomable reason – to pass over a particular stretch of path. No amount of tugging, shoving or bribery would dissuade her, although she could be tricked into relenting if you led her round in a circle first. Yet our struggle to see the world through her eyes proved oddly rewarding. Our excursion yielded many delights: the lush forests, the occasional views, the wildlife (squirrels, eagles, a nocturnal wild boar), the remote, tumbledown settlements, and the friendly keepers of the region’s various hostels. But the part that lives on most vividly in our family memory was our brief relationship with the enigmatic beast who was the expedition’s focal point. When our trek ended, back at its starting-point in Castagnols (near the southern end of Stevenson’s 120-mile route), we learnt that Gentiâne, Salome’s owners, don’t just hire out donkeys to walkers. They also offer extended sessions of expert-supervised “asino-therapie“. The donkey, it seems, is “très proche de sa nature, de ses besoins, de ses instincts” and, as such, is ideally qualified to help human beings to reconnect with their natural selves, promoting psychological and emotional well-being. We would have laughed at such an idea before we met Salome. Now, it would have been hard to think of a better description of what had happened to us. I wonder what she’s doing now?